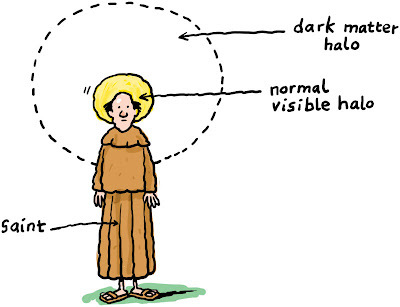 Vatican astrophysicists may one day confirm the existence of dark matter halos. Pen and ink on Moleskine with digital colour. 9cm x 12cm. Click to enlarge. I expect if you excited electrons in his outer haloic sphere there, they would fall back into their comfy spheres, expending energy and fluorescing a kind of brown. A holy sort of brown, extending even beyond the dark matter halo to the doesn't matter halo and not mattering. What a live we lead, eh? Damn, she does a good line in comments, does ol' pcb, eh? Doesn't need her own blog, gives full value elsewhere. Excellent -- great idea. Any reason why the arrow from the word "saint" is pointing to the holy man's crotch? The collisions mostly happen when the saints go marchin' in.